Iris histrioides 'Frank Elder' has been in full bloom for a week now, the last bit of color faded from the Eranthis cilicica a couple days ago and the Eranthis hyemalis and Galanthus elwesii are well along into setting seeds by the time the first Chionodoxa (glory of the snow) flowers open in my garden. Glory of the snow?! Here, the snow is good and gone by the time this blooms, but Chionodoxa spp. 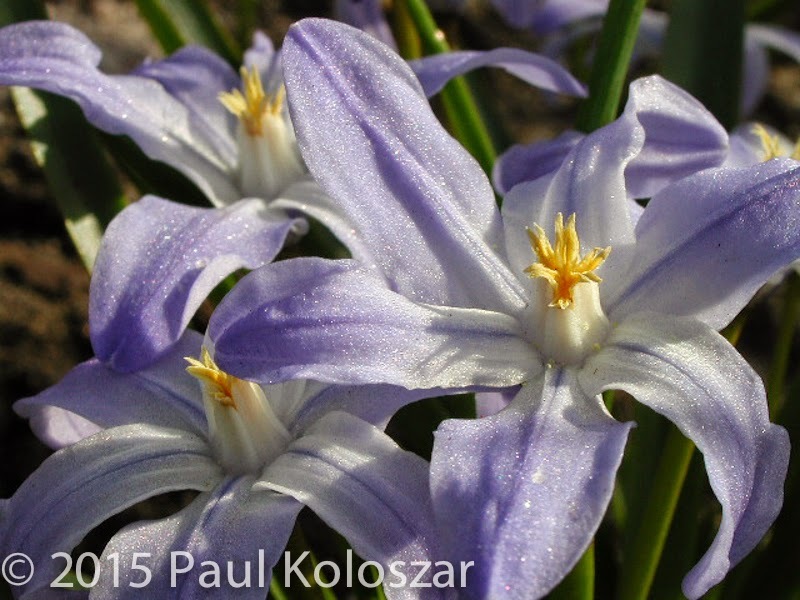 are known to flower while the snow is still on the ground in their native habitats of the eastern Mediterranean. 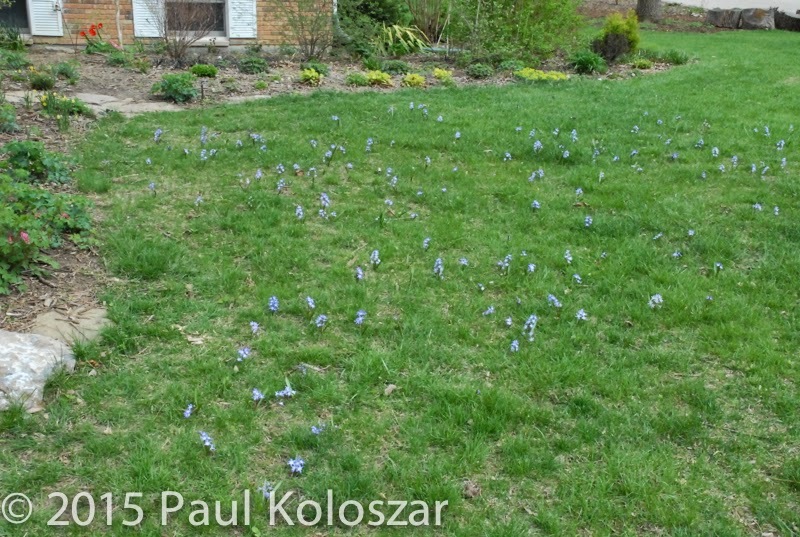 Small beginnings - most of the 300 Chionodoxa I planted around 2002. I think I need to mow a little later than I have. 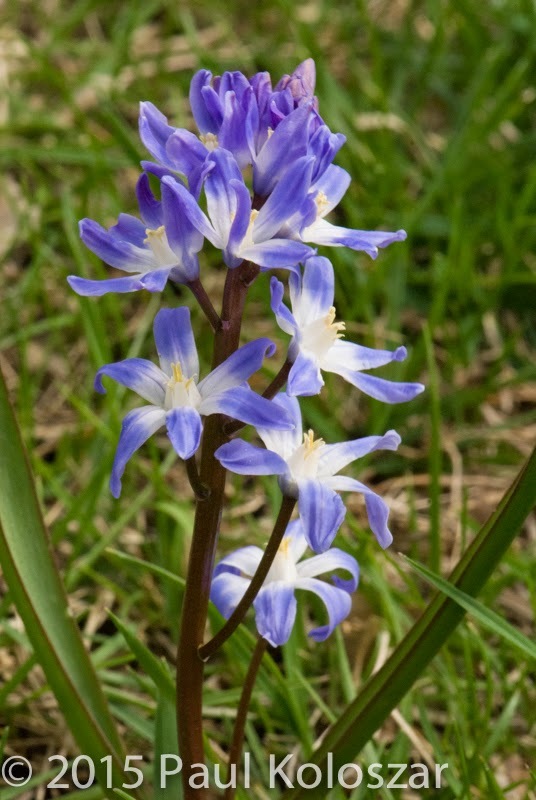 Although the Royal Horticulture Society's publication "Hyacinthaceae - little blue bulbs" (2005) recognizes 8 species, it seems as though only four species are currently widely accepted. One might even find it lumped into the genus Scilla. Nomenclatural squabbles aside, the differences between the widely accepted species are subtle enough that they are confused in the trade. 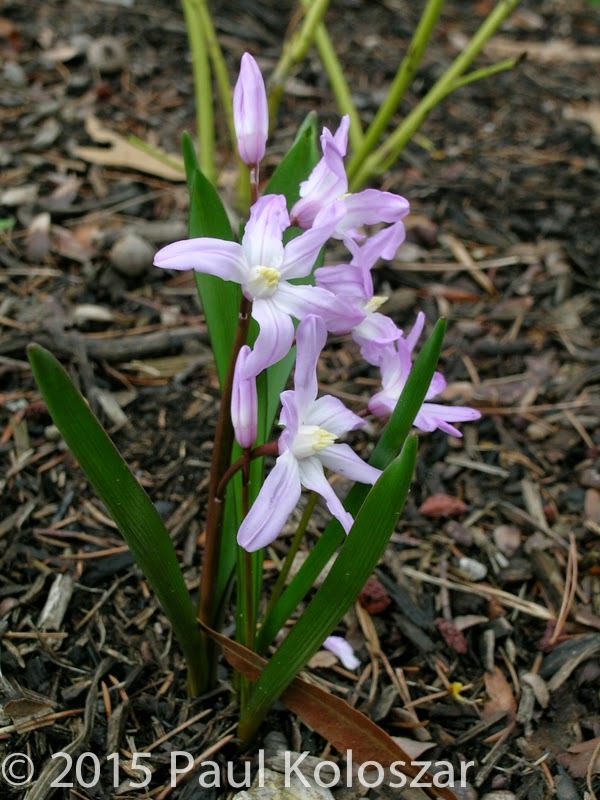 Some years ago, I ordered and planted 300 Chionodoxa forbesii. I didn't pay close attention to differences among them until I recently read the aforementioned RHS publication, and now I think I might have representatives of Chionodoxa forebesii, C. luciliae, and C. seihei. I'm not even sure. What I do know is that I like 'em. A lot. A little closeup action. Can I get a hubba hubba? 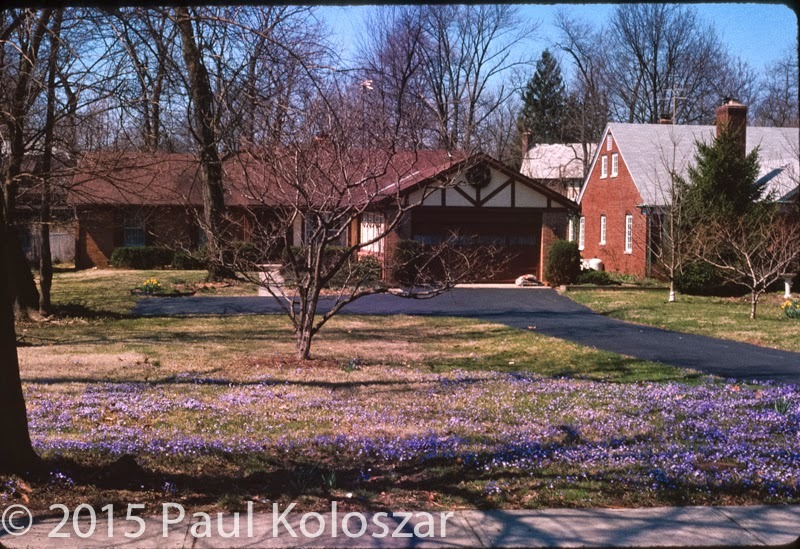 Scans of slides I shot in the '90's, this and the next image show the naturalizing potential for Chionodoxa spp. 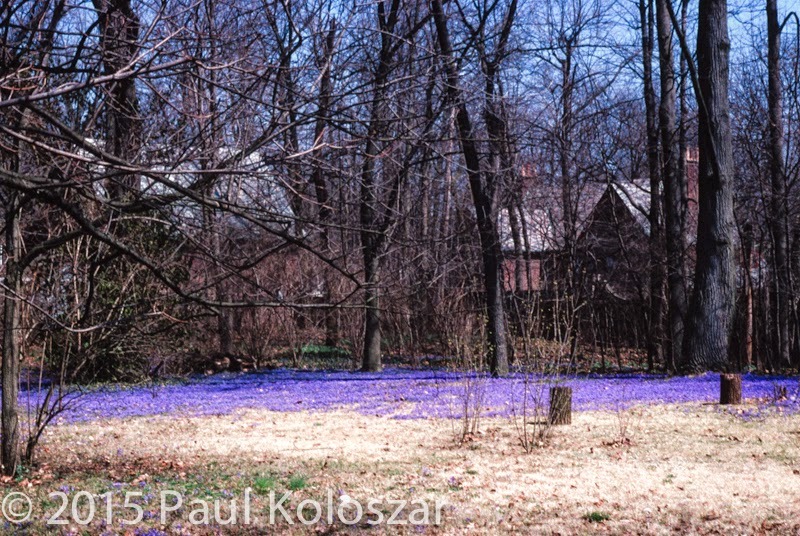 Maybe, someday, my yard will be covered in lavender blue like this. 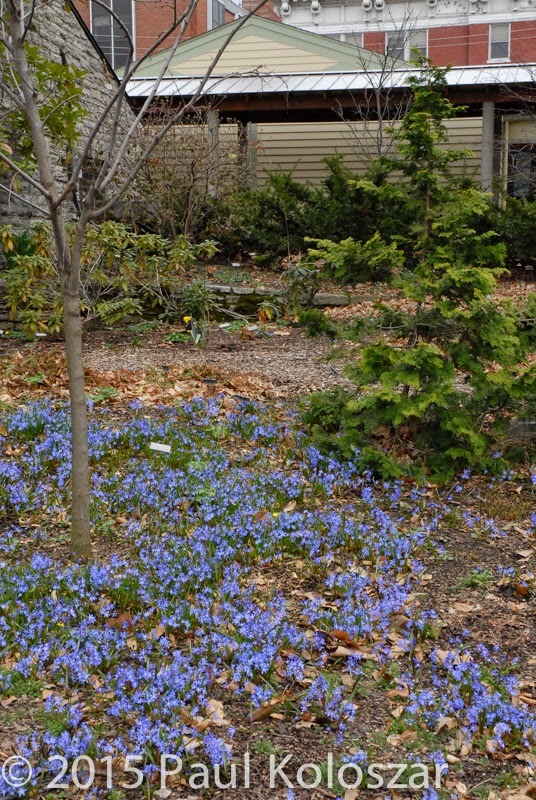 Chionodoxa with little competition under a redbud (Cercis canadensis).